Simply Elegant is a shining example of simplicity and modern grace. 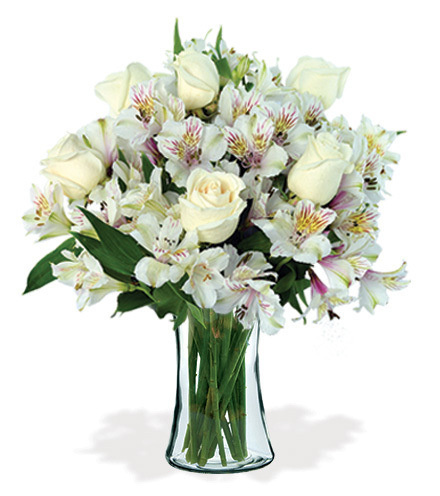 Our chic bouquet of striking white premium roses and white Peruvian Lilies, also known as Alstroemeria Lilies, are gathered together to create the perfect bouquet for an anniversary, hostess gift, or holiday gift. It's a standout surprise that fills a tabletop or any decor with sophisticated beauty. Lilies arrive in bud form for long-lasting enjoyment by the recipient.